“EBI” means Environmental Business International Inc.
“Affiliates” means shareholders, owners, officers, directors, employees, agents, attorneys, accountants, representatives, vendors, suppliers, writers, editors, researchers, successors and assigns. 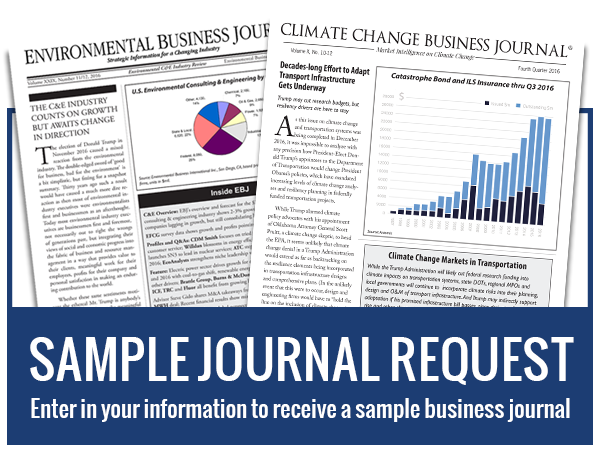 “Site” means the web sites at ebiresearch.com and climatechangebusiness.com, whether accessed through that URL or any other URL. “Content” means text, data, information, compilations, images, graphics, and charts. By accessing the Site or accessing or purchasing any Content on or from the Site, you agree to be bound by the terms and conditions set forth below. Copyright: You may not reproduce, transmit, repost, duplicate, distribute, display, adapt, modify or commercially exploit any of the Content on or purchased from the Site, including, but not limited to, EBI research reports, issues of CCBJ and EBJ newsletters and CCBJ and EBJ News, data and graphics, without express written permission from EBI. Requests for permission must be sent to info@ebionline.org. Failure of EBI to respond to a request for permission shall not constitute permission. Disclaimers/Indemnification: EBI does not warrant or make any representations as to the accuracy, subject matter, quality, completeness or timeliness of the Content on or purchased from the Site. While EBI seeks to provide accurate and timely information, there may be inadvertent technical or factual inaccuracies and omissions and typographical errors. EBI reserves the right to make changes and corrections at any time, without notice. To report any errors or omissions, please email info@ebionline.org. The Site and Content on or purchased from the Site are provided “as is,” without warranties of any kind, either express or implied. To the fullest extent permissible pursuant to applicable law, EBI disclaims all warranties, including, but not limited to, implied warranties of merchantability and fitness for a particular purpose. Content on or purchased from the Site is for informational purposes only, and EBI and its Affiliates shall have no liability to any person or entity for any loss, damages, or risk that may be incurred as a consequence, directly or indirectly, of the use of the Site or the Content on or purchased from the Site. EBI does not guarantee that the Site or Content on or purchased from the Site is free from viruses or other contaminating or destructive malware or properties. You use the Site and Content on or purchased from the Site at your own risk. Upon EBI’s request, you agree to defend, indemnify and hold harmless EBI and its Affiliates from any claims, demands, lawsuits, and expenses, including without limitation reasonable legal fees, related to any breach of these terms by you or arising from your use of the Site or Content on or purchased from the Site. While Content on or purchased from the Site may reference laws, investment styles, or specific investments, EBI does not provide legal or investment advice, and nothing found on or purchased from the Site constitutes legal or investment advice. Any mentions of companies or web sites contained on the Site or on Content on or purchased from the Site are only for the purpose of providing additional information in order to help you with your own research. EBI does not recommend, endorse or claim anything on behalf of such companies or web sites. Use of the Material: Neither EBI, nor any of its Affiliates, will be liable to you or any other person or entity for any loss, injury or damage on account of (a) any failure or interruption of the Site, (b) any act or omission of any other person or entity involved in making available this Site or Content on or purchased from the Site, or (c) any other cause relating to your access to, inability to access, or use the Site or Content on or purchased from the Site, whether or not the circumstances giving rise to any such cause may have been within the control of EBI or any of its Affiliates. In no event will EBI or any of its Affiliates be liable to you or any other person or entity for any direct, special, indirect, consequential incidental damages or any other damages of any kind (including, without limitation, damages for loss of business profits, business interruption, loss of business information or other pecuniary loss) arising, directly or indirectly, from the use or failure to use the Site or Content on or purchased from the Site, even if EBI or its Affiliates have been advised of the possibility of such damages. Also, in no event will any liability of EBI or its Affiliates to you, or to any person or entity, arising out of any kind of legal claim (in contract, tort, or otherwise) in any way connected with the Site, Content on or purchased from the Site, or breach of this Agreement by EBI exceed the amount, if any, paid by you to EBI to purchase Content from the Site or to use this Site or its Content. Use of Links: Should you use a link on this Site or on its Content and thereupon view or use Content not provided by EBI, you do so at your own risk. The web site or Content to which you link will not have been developed, checked for accuracy, or otherwise reviewed by EBI, and EBI makes no guarantees or representations as to the accuracy, subject matter, quality, completeness or timeliness of any services, information or other Content provided via any such link. EBI and its Affiliates are not liable to you or any other person or entity for loss, injury or damage caused by any problems, misinformation, delays, defects or omissions that may exist in the services, information or other Content provided via any such link, whether actual, alleged, consequential or punitive. Warranties and Indemnity: You shall indemnify, defend, and hold harmless EBI, and its Affiliates against any loss, claim, demand or expense, including without limitation attorneys’ fees, arising in connection with (a) the use by you or anyone acting on your behalf of the Site or Content on or purchased from the Site, (b) any breach of this Agreement by you or anyone acting on your behalf, or (c) any new material inserted by you or anyone acting on your behalf into any Content on or purchased from the Site. In defending any such claim, EBI may use attorneys of its choice. Registration, Passwords and Responsibilities: In the event that certain areas of the Site are only opened to you if you register, then the following rules will apply. You will be solely responsible for the confidentiality and use of and access to the Site and its Content using your own user name/ID and password. You will immediately notify EBI if you become aware of any loss or theft of any password or any unauthorized use of a password, user name/ID, or of the Site or its Content. 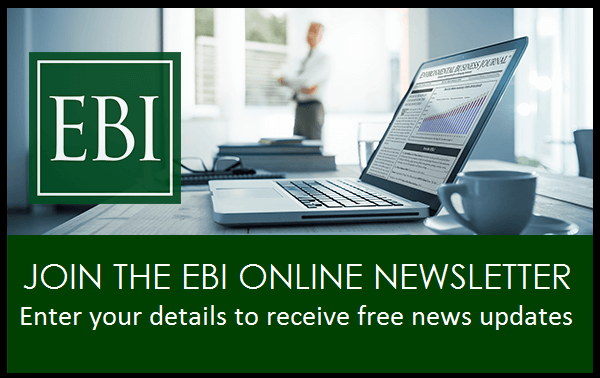 You will provide EBI with accurate, complete registration information (including without limitation your e-mail address) and promptly inform EBI of any changes to such information. For purposes of confirming compliance with this Agreement, EBI shall have the right to monitor and record activity on the Site, including without limitation access to the Site and its Content. Each registration will be for a single user only, and you will not share your user name/ID and password with any other person or entity nor share or transfer your registration or any resulting subscription. You may not facilitate, permit or make available access to multiple users on network through your user name/ID and password. If you violate any of the terms or conditions of this Agreement, EBI may cancel or suspend your access to the Site or Content on or purchased from the Site, without notice, refund, or other obligation to you. Miscellaneous: No waiver by either party of a breach of this Agreement by the other party shall constitute a waiver of any subsequent breach. This Agreement shall bind and benefit the parties hereto and their respective successors and assigns. You may not assign this Agreement or any right or obligation hereunder without EBI’s prior written consent. This Agreement is the complete understanding between the parties with respect to its subject matter and supersedes any oral or written communications or representations or agreements relating thereto. No changes, modifications or waivers regarding this Agreement shall be binding unless in writing and signed by the parties hereto. However, notwithstanding the foregoing, EBI may amend this Agreement at any time by posting the amended Agreement on the Site. This Agreement, its validity, construction and performance shall be governed by and construed under the laws of the State of California without regard to the laws that would otherwise apply under applicable conflict-of-laws or choice-of-law principles. The parties hereto agree to submit to the exclusive jurisdiction of the federal courts in the Southern District of California and state courts located in San Diego, California in connection with any matters arising out of this Agreement and waive any objection to the propriety or convenience of such jurisdiction or venue.